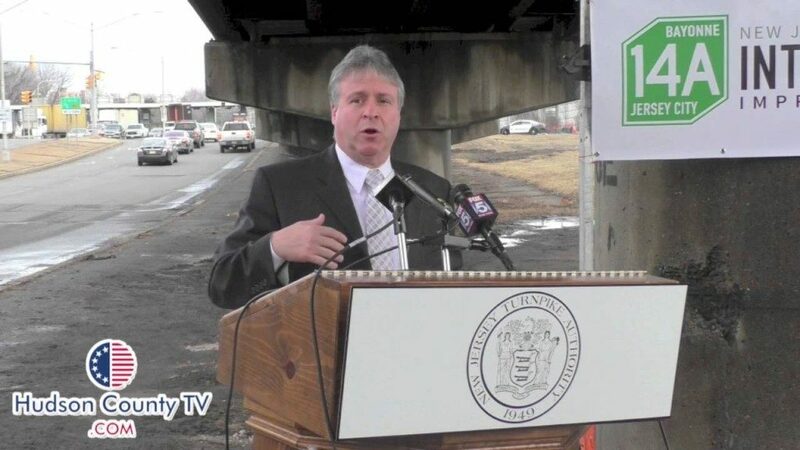 Mayor Jimmy Davis announced that the New Jersey Turnpike Authority and its contractors have provided updated information about the construction around the Exit 14A toll plaza. For the connector bridge from the toll plaza to Port Jersey Boulevard, workers are preparing and preassembling structural steel for erection over Route 440, the Light Rail tracks, and the freight train tracks. That structural steel will be raised over Route 440 during the last weekend of August, beginning Thursday night, August 25, and again in late September. The structural steel is expected to go up over the Conrail and Light Rail tracks during the weekend of September 9. In the core of the toll plaza, Lanes 3 and 4 are undergoing reconstruction. Renovation work is continuing at the Toll Plaza building. Over the weekend of August 12-14, concrete and asphalt paving of Lanes 3 and 4 near the toll plaza took place. Over the weekend of August 26-28, Toll Lanes 3 and 4 will be reopened. Toll Lanes 5 and 6 will be closed to accommodate construction. Northbound traffic on Avenue E will be reduced to a single lane of traffic between 52nd Street and the toll plaza, from Friday, August 26, at 8:00 p.m., to Sunday, August 28, at 8:00 a.m.
On the ramps between the toll plaza and the Hudson County Extension, widening work is continuing. Local street level work is continuing at Avenue C, Kennedy Boulevard, and Garfield Avenue. Single daytime lane closures will be used as needed on those avenues. During the evening of Thursday, August 11, traffic was shifted left on the westbound ramp, and a work zone was created on the right. During the weekend of Friday, August 19, to Sunday, August 21, the east-bound off-ramp will be reduced to a single lane of traffic from the Friday at 9:00 p.m. to the Sunday at 4:00 p.m., in order to accommodate roadway reconstruction. Around the intersection of Route 440 and Pulaski Street, construction is continuing on the new bridge piers (columns), on the Pulaski Street roadway, and on the jughandle ramp. Drilled shaft construction is moving ahead in the median of Route 440 for the new ramp bridge to southbound Route 440. This area is being prepared for pre-assembly of a box girder and the assembly of a crane. On Thursday, August 18, the jughandle area will start to receive structural steel in advance of erecting it over roadways and rail lines. In the ramp area east of Route 440, construction continues on the mechanically stabilized earth wall and the new bridge abutment. New drainage installation and roadway construction are progressing in the work zone on Chosin Few Way and Pulaski Street. Reconstruction of a Jersey City utility facility is continuing. In the next few weeks, workers will begin Center Street tie-in and roadway reconstruction.